The other day I began to think about my sin. Now, I think most of us know we’re sinners. We know that we do things wrong. But I don’t think we often really, really contemplate the magnitude of our sin. So this particular morning, I began to think back over my attitude, my thoughts, my agenda. Even on the best of mornings, when I hadn’t even had time to lose my temper or to say words I wish I could take back, my mind and my heart had been furiously brewing sinful thoughts and desires. Our sin nature is a constant battle. And I think we get so used to it, that we often only count the big sins. The big mess-ups. The ones that are the most visible or most damaging or most visceral. But oh, the enormity of our sin. Pride. Fault finding. Mixed motives. Worry. Thanklessness. Impurity. Lies. Half-truths. Greed. Selfishness. Demanding my rights. Self-righteousness. Complaining. Blaming. Holding grudges. Unkindness. Jealousy. Covetousness. Anger. Rudeness. Gossip. Dishonesty. Drawing back from God. Disobedience. Faithlessness. Abusing freedom in Christ. Rejoicing at someone’s difficulty. Not turning away my eyes. Not turning away my ears. Creating division. Stirring up strife. Unforgiveness. Discontent. Loving money. Idolatry. ​I began to mentally tick through this list as I scrutinized my sin that morning. And then I added the sins of the day before and those of the week before. Then I tried to wrap my mind around the magnitude of my sin for every day of every week of every year of my life. Oh, the enormity of my sin. And not just mine. I extrapolated the immensity of all sin for all mankind -- every person, every people group, every continent, every century. It’s too huge to imagine. Too much to even try to calculate. ​But that immeasurable burden is the weight that Jesus bore on the cross. 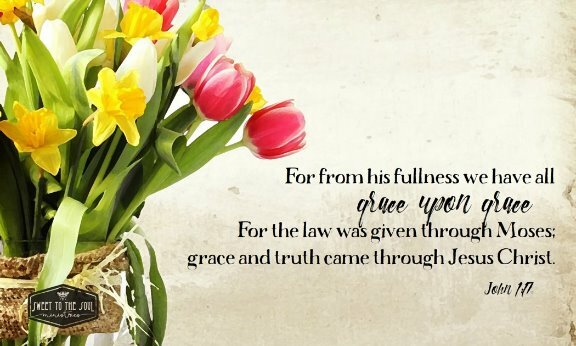 ​As Christ took the full weight of our sin, He gave us the fullness of His grace. Read that list again. Go back through the list and this time, after every single sin, imagine it covered by this: grace. Grace upon grace upon grace. 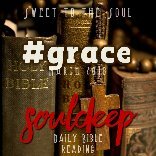 ​If the sin of the world is immeasurable, the grace of God is inexhaustible. John 1 tells us that Christ ushered in not only grace but truth. One without the other is an imbalance and skews who we are and what Christ has done. Truth shows us our real selves. Grace robes us in righteousness. Truth shows us our real need. Grace gives what we could never earn. Truth shows us the way. Grace makes the way possible for us. Truth shows us the Savior – Jesus. Grace makes us His friend. This Easter season, do you know the weightlessness of grace? Do you know the promises of truth? John 1 tells us it is found in the Only Begotten Son, Jesus. 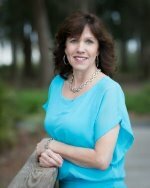 ​Lisa Appelo is a single mom to 7 and unexpected widow, writing about the faithfulness of God and all of the crazy good lessons He teaches at TrueandFaithful.net. I needed to read this this morning, Lisa. Thank you for sharing! Thank you Lisa Appelo for your constant words of encouragement. You have helped me while feeling depressed and alone. Grace, Grace, Gods Grace... Greater than ALL my sin! Praise His Name! Doing a study on parenting with grace. Really needed to hear all this though. Thanks, Lisa for your sincerity and vulnerability. Your words are such a blessing to me personally. May the Lord bless you and all of your sweet ones richly. Love & miss you.